Controls (aka "Control Flow") change the flow of your program and enable conditional or branching logic. For example, "if speed > 20, then turn LED lights red." There are lots of different types of controls to make interesting programs that go beyond a procedural set of Movement commands. 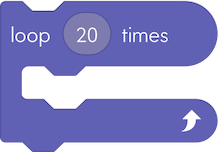 A loop (aka a "for" loop) repeats the designated code for a given number of times. Here's a simple example that spins 90 degrees and says "Spin" 8 times. Notice that var _i1 creates a "loop variable" called _i1 to track the iterations through the loop. When you define new loop variables, you can use any name you like as long as it is unique, but we use this convention to be consistent with the code generated from our blocks canvas. Loop until (aka a "while" loop) repeats the code within until a condition is met. You will need to understand how to write conditions with Operators and Comparators before using Loop Until and the rest of the controls below. In this template, testCondition is an expression that evaluates to true or false. The ! operator, meaning "not", reverses the value of the test condition. So, if the test condition is true, !test condition will evaluate to false and the loop will end. In other words, the loop terminates when the test condition becomes true. 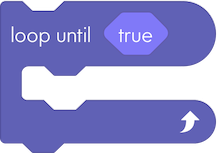 Loop Forever (aka "while 1" or "while true" loop) repeats the code within forever, or until you stop the program. If Then statements execute the code within only if the given condition is true. For example, if you hold the robot and shake it, the lights will turn green and speak "Shake". You need to nest an if...then statement within a while (true) loop like the one below. The parent while (true) keeps your program running forever, which gives you time your robot one or more times. 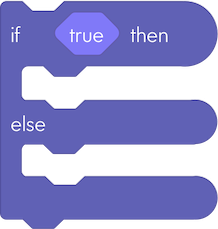 If Then Else statements execute the code contained within the "if" code when the given condition is true; otherwise performs the "else" code. return terminates the execution of a function and returns control to the calling function. A return statement can also return a value to the calling function. This is not available in the block canvas. // No 'async' functions in here!